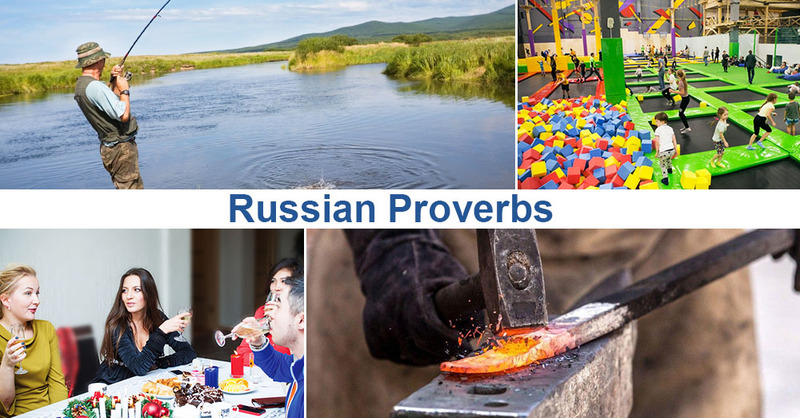 In the previous article we looked at a few most popular Russian proverbs. In the second part of the article we are going to talk about some other Russian proverbs. The English equivalent: “No pain, no gain”. The literal translation: “Without effort, you can’t even pull a fish out of the pond”. The saying means that any work you do requires effort and diligence. You should work hard in order to get result. The English equivalent: “The Lord helps those who help themselves”. The literal translation: “God keeps those safe who keep themselves safe”. This saying means that if people are cautious and careful, they will avoid any danger, and nothing bad will happen to them. Russian people often use this saying when they give someone advice to be careful and not to take risk. The English equivalent: “East or West, home is best”. The literal translation: “It is good to be visiting, but it is better at home”. The meaning of the saying is that peace and comfort created with your own hands or your beloved ones cannot be substituted by somebody else’s place, because you can feel really relaxed only at home. People say it when they have had a really good time at their friends’ place but are really happy to be back home. The English equivalent: “Live and learn”. The literal translation: “Live for a century – learn for a century”. This saying means that you can learn as long as you live. Every day you learn something new, widen your outlook, and get wiser. The English equivalent: “Don’t count your chickens before they hatch”. The literal translation: “Dividing the pelt of a bear not yet killed”. The saying means that it is not worth dividing something that you don’t have yet, that is to plan in advance, or to resolve any issues in advance. The English equivalent: “There’s a time for work and a time for play”. The literal translation: “Time for business, an hour for fun”. Russians use this saying when a person does not want to work but wants to have fun. The saying means that important business requires more attention and time than fun. The English equivalent: “The cat would eat fish and would not wet her feet”. The literal translation: “It is wanted and repellent”. Russians use this saying when somebody being afraid of certain difficulties, dangers, or obstacles, does not feel brave enough to fulfill what they really want to. The English equivalent: “Make hay while the sun shines”. The literal translation: “Strike while the iron is hot”. This phrase means that it is necessary to hurry up to do something while there is a possibility, time, favorable conditions, so you should make use of the moment to fulfill what you have planned. The English equivalent: “Ignorance is bliss”. The literal translation: “The less you know, the more soundly you sleep”. This is a very popular saying in the Russian language, and it means that sometimes it is better not to know some things than to know about the things which might cause problems. The English equivalent: “Like father like son”. The literal translation: “The apple falls not so far away from the apple-tree”. This very popular saying is often used negatively when people want to highlight that a child in some aspects of his character is similar to his parents. Russians often use this saying when they want to say that a child looks like his parents. We hope that you have found this article useful, and in the future you will use these saying to make you sound more native-like!